Hair removal is a constant worry for men and women alike. For patients who are sick of the hassle associated with shaving, waxing and other temporary hair removal methods, laser hair removal may be the solution. When hair follicles are exposed to concentrated doses of laser light, active hair growth is delayed and suppressed. Laser hair removal is ideal for patients with dark hair and light skin, although patients of any skin type may be treated at the Center for Dermatology and Laser Surgery. Common areas treated for hair removal would be the lip, chin, neck, back, arms, legs, and bikini area. Unfortunately white, gray, blond, and red hair, do not respond well to laser hair removal. Since individual hairs grow at different times, multiple treatments are required for significant clearance, at intervals of four to six weeks. The number of sessions depends on several factors, including hair and skin color, hair follicle size, and hormone levels. The average patient sees up to 80% reduction of hair growth after six to eight treatments. Laser hair removal is semi-permanent, meaning treated hair follicles will begin to grow hair again at some point if maintenance treatments are not undertaken. While there is no cure for rosacea, there are several treatments available to help control symptoms and allow patients to enjoy their lives without constantly worrying about the appearance of their skin. 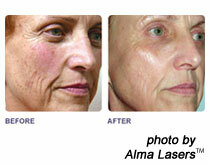 Laser technology primarily targets red color in the skin, treating background redness, blemishes, and blood vessels. We use the Harmony® XL Advanced Fluorescence Technology (AFT) intense pulsed light to treat rosacea. It is typically used to treat larger areas of the forehead, cheeks, nose and chin, and sometimes the entire face. Often used in tandem, the Candela Vbeam safely targets persistent areas of redness and individual blood vessels. Rosacea therapy treatments involve minimal discomfort and individuals can return to work and resume normal activities the same day after laser therapy. As with most laser treatments, multiple sessions are needed for optimal results. Intense Pulsed Light (IPL) (Harmony® XL AFT Laser Treatment) – an advanced, versatile system that is highly effective in improving the color and tone of the skin through simple, noninvasive procedures. Pixel Laser Resurfacing (Harmony® High Power Pixel Laser Treatment) – is a part of the Harmony® XL laser system, used for non-ablative skin resurfacing for aging, damaged or scarred skin. This treatment can be used to improve the appearance of fine lines and wrinkles, reduce the appearance pores, fill in acne scars and improve overall skin pigmentation. While many scars fade over time, many patients experience disruptions to the healing process that cause scars to become discolored, raised, indented or otherwise deformed. Laser scar therapy gently removes damaged layers of skin, stimulating collagen production, and revealing new, restored skin underneath. The precise technology used during laser treatments ensures that only damaged tissue is treated, while healthy surrounding tissue remains intact. Our providers use the most advanced, state-of-the-art equipment available to ensure safe and effective scar treatment in even the most prominent and sensitive areas. Many treatment options are available for moderate to severe acne, and it can be overwhelming. For patients who are unhappy with their current regimen, or who are uncomfortable with taking oral medications, BLU-U® blue light therapy may be an option. Used alone, blue light therapy is effective in killing skin bacteria that contribute to the development of acne. The treatment is not painful and takes less than 20 minutes. It is typically performed once or twice weekly for 4-8 weeks. 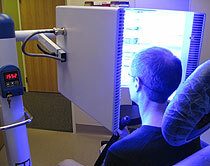 Sometimes, a photosensitizing medication called Levulan will be applied to the skin before blue light therapy. This is called BLU-U® photodynamic therapy. When Levulan is absorbed into the oil glands of the skin and is then activated by blue light, it will destroy the cells in the oil glands, making them smaller and decreasing oil production. There is more stinging, burning, redness, and inflammation after photodynamic therapy when compared to blue light therapy alone. A total of four treatment sessions are typically performed at four week intervals.